Christmas tree is the symbol of Christmas. Holiday decorations are considered incomplete without well decorated Christmas tree. So why not paint Christmas tree patterns on your nails this Christmas. Make Christmas tree nail art with red, green and white colors on your nails. Use scotch tape for making Christmas tree designs on your nails. Step by step Christmas tree nail art tutorial is given below. All you need is nail paint of red, white, silver and golden color as well as pieces of scotch tape. Use glitter nail color for making Christmas tree to symbolize Christmas tree lights. 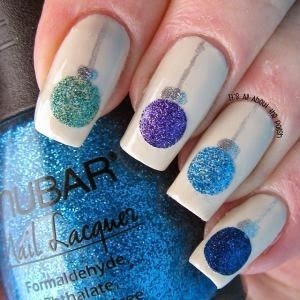 You can also paste beads on your nails for making Christmas tree. You can also paste stickers of Christmas tree on simple painted nails. Here are some more DIY easy holiday nail art ideas. Paint your nails with reindeer, snowman, snowflakes or Christmas baubles designs to give new look to your hands. You can also paint berries or poinsettia flowers on your nails as well. Some easy nail art designs for Christmas are shown in pictures I have displayed below.